If you long to dig your toes deep into a briny beach, stroll through green valleys with dozens of sheep, and sip warm Guinness in a quaint, cozy pub, Southern Ireland is the place for you. Complete with crisp coastlines, ancient mountains, and irresistible bites, the region is quickly gaining popularity amongst wanderlust romantics. Are you ready for an adventure? Let’s explore! 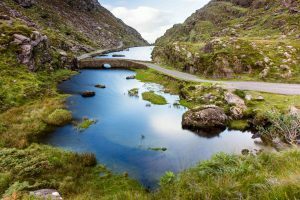 With over 25,000 acres of lush woodlands, sparkling lakes, and high mountain peaks, Killarney National Park is one of Ireland’s most breathtaking treasures. It is home to the only red deer herd on mainland Ireland and a variety of other diverse species, some of which are very rare. It’s because of the vast, delicate nature of Killarney National Park that is was designated as a UNESCO Biosphere Reserve in the early 80s. The highest peak in Ireland, Carrauntoohil is 3,406 feet high and serves as the central peak of the Macgillycuddy’s Reeks range. The hike to the summit isn’t for the faint of heart, but it offers some of the most spectacular views of the Irish countryside. To truly understand Ireland’s charm, drive or bike the entirety of the Dingle Peninsula. Home to local bed and breakfasts, delicious restaurants, and picturesque beaches, one could easily spend the entire day (or weekend) exploring the charming town of Dingle. The Kerry Way is one of the largest walking trails in Ireland. It can take anywhere from eight to ten days, but the journey offers some of the best views in the country. Weaving through the Southern Irish wilderness, The Kerry Way showcases small, often overlooked towns like Glenbeigh and Kenmare. If you don’t have more than a week to spare, you can explore certain parts of the trail! Experience an exhilarating adventure on the Cosmopolitan, Explorer, and Continental tours. It’s never too late to get a taste of a multitude of exciting cultures! Explore the vast Irish Countryside on the Hops, Grains & Slainte Adventure! This entry was posted on Wednesday, April 4th, 2018	at 12:01 pm	. You can follow any responses to this entry through the RSS 2.0	feed. Both comments and pings are currently closed.